This is easily one of my favorite events of the year. 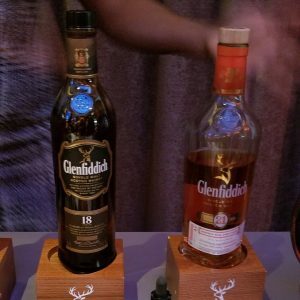 It is an opportunity for me to try so much bourbon, Scotch and other fine spirits for a flat fee, which is helpful for me to decide what new bottle I will add to my collection. However, this year two days before the event I won a Fine Wine and Spirits lottery to purchase a limited bottle of William L. Weller Antique Collection cask strength bourbon, so my fancy purchase was done for the year. This leads to me caring less about remembering what I tried was good and more about trying as much as I could. Every year on Halloween weekend, Pennsylvania Fine Wine and Good Spirits stores holds events across the state to allow sampling of mostly a variety of whiskey, but also a limited number of other spirits. In Pittsburgh, this event is held at the Rivers Casino and comes with a buffet dinner. If tickets are purchased when they first go on sale it is 2-for-1 at $110. This is an amazing value for sampling lots of liquor and a buffet dinner. 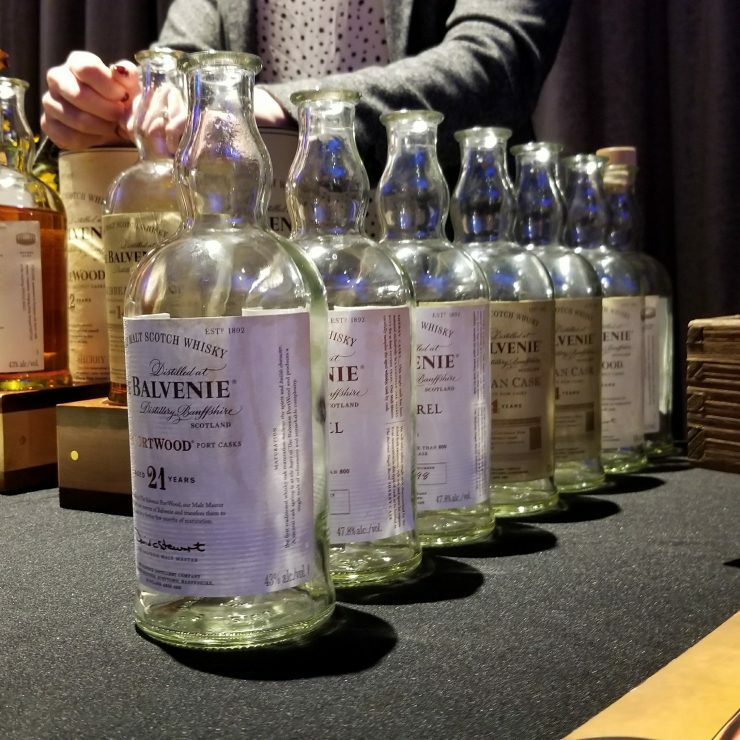 This event usually has at least a couple bottles of well-aged Scotch or limited bourbon to sample that easily makes up the cost compared to getting a pour of each at the bar. This being my sixth year in attendance, my friends and I have learned we need to both plan ahead and get in line early. The event usually releases a list of vendors with the spirits they intended to provide a few weeks prior to the event. Unfortunately this year’s list was a little lacking. 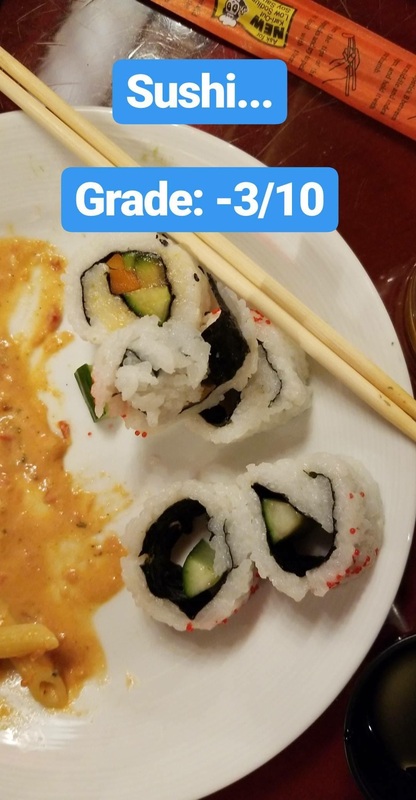 It was a lot of average bottles. 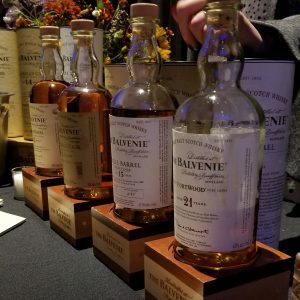 A couple 21 year old Scotches from Balvenie and Glenfiddich, Johnny Walker Blue Label, and a couple of limited releases made up the bulk of the special items. We have learned if we want those we need to get in early. Line up for the event starts at 5 and we try to get there just a little after so we aren’t too eager looking. Instead of being first in like we are like 10th. The event starts at 6 and this is one of the longest 45 or so minutes of aimlessly waiting. Finally, the event starts and we are allowed up to the second floor banquet space. Greeters hand out sampling glasses and the walls are lined with vendors. Some companies will have giant displays to attract you to their booths. This is usual for brands like Jim Beam and Maker’s Mark, which are more common. As we know what those taste like we pass them for less common samples. Out first set of tasters came as a surprise. 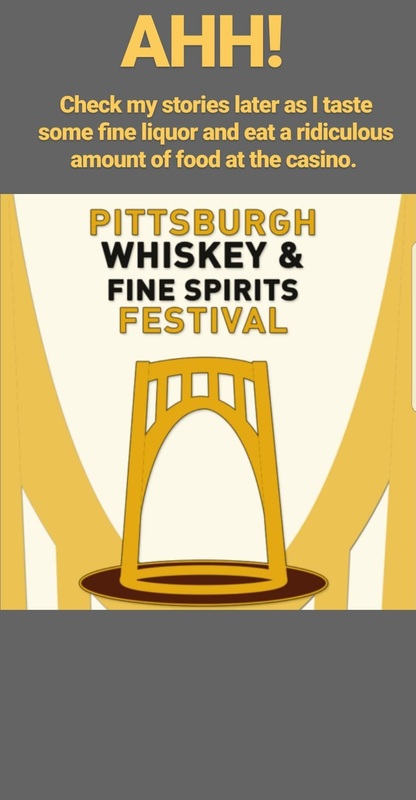 The first booth was a selection of craft distilleries: Pittsburgh’s own Maggie’s Farm, Liberty Pole from Washington, PA and Catoctin Creek from Virginia. These might have been some of the best items we tasted all night. Maggie’s Farm specializes in rum and liqueurs and might be some of the best I’ve had in the United States. Liberty Pole and Catoctin Creek distill whiskey to which they had a fantastic peated bourbon and cask strength bourbon respectively. Next, we stepped into the back reception area which hid Balvenie and Glenfiddich. 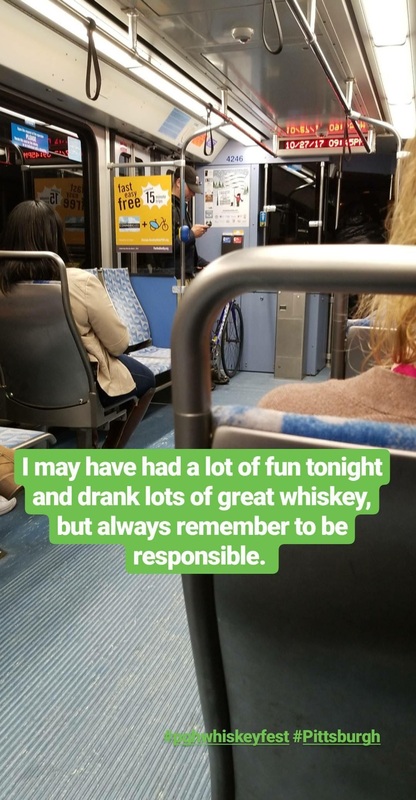 Both offer tastes of their 21 year Scotches if you can arrive early enough. We did. For those that do not know, the longer a whiskey ages in casks the less harsh it can be on the palette because the alcohol gets smoother, but also allow for it to better absorb the flavor profile of the cask and other items used in aging. These two distilleries easily offer two of the best samples available at the festival. From there, we entered the main hall looking to sample some new or different items. The main hall will have a mix of all kinds of spirits, but still primarily whiskey. This was the first year that other than the first rum samples from Maggie’s Farm did I stay away from other liquors. In the main hall, I specifically enjoyed samples of Nikka Coffey Japanese Whisky, Pittsburgh local Wigle Whiskey, and Laphroaig. We also samples lots of water. It’s very important to keep hydrated while having so much whiskey. They provide coolers of water bottles all over the hall. We grabbed bottles multiple times as we walked around. Next we headed to dinner. Included in the festival price is the casino buffet. I always see buffets as a challenge. Add in the fact I have had many samples of whiskey over the last hour and I was ready to take on this challenge. 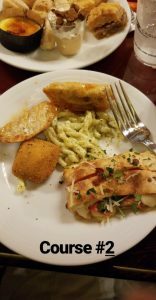 I started with two plates filled with various cuts of meat, noodles, ravioli and more. 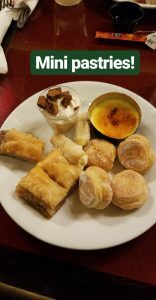 I then got a third plate of some of the favorites from the first trip and a plate full of mini pastries. As I have mentioned before, I love mini pastries. 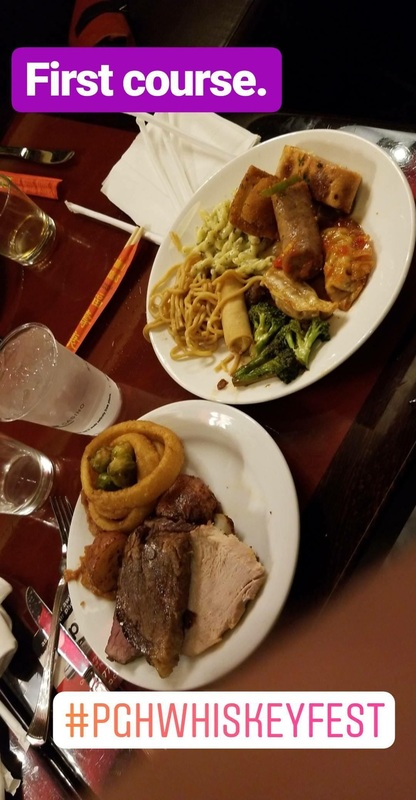 Even through I was already getting pretty drunk, but the food at the buffet was just mediocre this time. Maybe it was that they were bringing out food so fast or maybe the quality really has gone down. Who knows? All I did know was that I had an irresponsible amount of whiskey followed by an irresponsible amount of food. And now to continue having an irresponsible amount of whiskey. We returned to the tasting rooms to make another round. By this time, vendors have pretty much run out of their more expensive liquors. There were still lots to sample. I made additional rounds for more Maggie’s Farm, Liberty Pole, Catoctin Creek, Balvenie, Glenfiddich, and Nikka Coffey. After three hours, my stomach was full of whiskey, water and food. It was time to head home. I surprisingly managed to get back to my office, get my belongings and get home without issue using public transportation and not falling asleep. At home, I was even able to have a glass of Pedialyte and more water before laying down and instantly passing out in all my clothes. 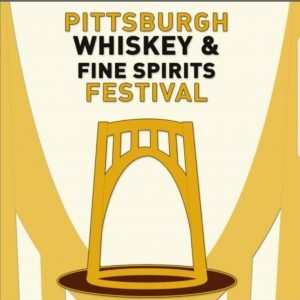 The Pittsburgh Whiskey Festival might not be the fanciest of festivals, but I always consider it a successful evening. Once again for the disclaimer, the amount of whiskey I tasted I probably should not be tried by everyone. Know your limits. In years past, I have told certain friends to not try to keep up or watched friends as they got sick. My abilities have taken years of training. No one likes a sloppy mess so I try to remain a well put together mess if I can. The other obvious things of drink responsibly, be of legal age and don’t drive.